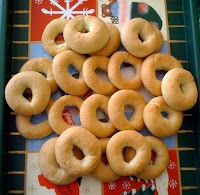 TheArmenianKitchen.com : It’s not too late to make these sweet treats for Christmas! It’s not too late to make these sweet treats for Christmas! Christmastime conjures up images of tables filled with beautifully adorned cookies, candies and sweets. 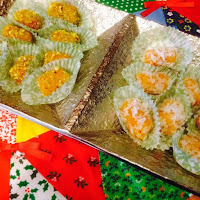 Over the years, The Armenian Kitchen has posted a fair share of specialty desserts suitable for holidays – or any day! Because Christmas Day is near, here a just a few simple recipes you might like to make. 1. Using an electric hand or stand mixer, cream together butter and sugar, until blended. 2. Add eggs, vanilla, baking powder, salt, and milk. Mix until blended. 3. Add flour, one cup at a time, mixing well after each addition until a dough forms. At this point, gently work dough with your hands on a lightly floured surface. If the dough is too sticky, you might need to add a little more flour. 4. Pinch off about a walnut-size piece of dough and roll it into a 6 inch rope. Shape into a circle (doughnut-shape) with lightly floured hands by pressing rope ends together. Continue this process until all dough is used. 5. Place cookies on a lightly greased baking sheet. 6. Place baking sheet on bottom rack in the oven. Bake in a preheated 375°F oven for about 20 minutes or until golden brown. 7. Cool completely on a wire rack. 8. Store in an air-tight container. Cut butter into flour, using fingertips. Add yolk and sour cream. Mix well. Dough should be sticky. Shape into ball and sprinkle with flour. Wrap in waxed paper and chill several hours. Divide dough into 3 parts. Roll each section out to a large circle like a pie shell. Cut, as you would a pie wedge, into 12 sections or less. Mix nuts into apricot preserves. Place heaping teaspoon into large section and start rolling toward small point to make crescent-shape (using fingers) as you place on (ungreased) cookie sheet. Bake in 350° oven 15 to 20 minutes until golden brown. 1. 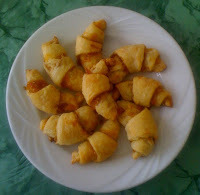 I used a pastry blender instead of my fingers. 2. After making the dough, I separated it into 3 equal balls, wrapped them individually, then refrigerated as directed. I kept the other balls of dough in the refrigerator until I was ready to use them. 3. After rolling each ball into a 12 inch circle, I spread 1/3 of a 10-ounce jar of apricot preserves on the surface of the dough. 4. Then I sprinkled about 2 or 3 Tbsp. of chopped pecans over the apricot. 5. I used a pizza wheel to cut the dough into 12 wedges. The wheel made this so easy! After that I prepared the recipe as directed. 6. Be sure to cool the cookies on a wire rack. Store in a container with a tight fitting lid. 1. Using a wooden spoon, cream the softened butter until fluffy. Beat in powdered sugar, mixing well. 2. Beat in egg yolk and Arak. 4. With lightly floured hands, pinch off pieces of dough and roll into 1- inch balls. 5. Place on ungreased baking sheets. 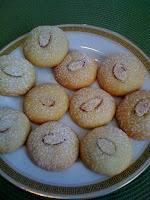 Flatten slightly and press a blanched almond slice in the center of each cookie. 6. Bake in a preheated 350°F oven for about 20 minutes. Cool completely on baking sheet. Dust with powdered sugar, if desired. NOTE: The recipe can easily be doubled. Place apricots in a bowl with enough warm water to cover; soak for 10 minutes or until apricots become plump. Drain; pat dry with paper towels. In a food processor fitted with a metal “S” blade, pulse half of the apricots a few times. Remove from the processor, and pulse the rest of the apricots. Place all of the pulsed apricots to the in the processor, along with powdered sugar and orange juice (if using); process until a paste is formed. Make sure all of the sugar is blended in with the apricots. Place the apricot paste in a bowl; refrigerate about 30 minutes. Divide the apricot mixture into fourths. Working with ¼ mixture at a time, place it on a piece on parchment paper on a work surface. Shape and roll it into a rope about ½-inch in diameter. Cut the rope into one inch pieces. Coat each piece in either ground pistachios, shredded coconut, or powdered sugar. Place coated pieces on a parchment-lined plate and refrigerate for about 30 minutes so they can firm-up. To serve: Place each in a mini paper or foil liner.